There is a growing interest in the use of chest x-rays (CXR) as a screening tool for TB within enhanced case finding programs . TB prevalence surveys show that CXR has higher sensitivity than verbal screening for identifying pulmonary TB . Previously, costs, limited access to x-ray facilities, maintenance of equipment, availability of trained personnel and inter-observer variation meant that the role of CXR within diagnostic algorithms was limited . CXR is widely used for detection of TB for a long time in especially North America and Europe, but many factors until recently complicated its use in low and medium resource countries. Digital radiology allows for low running costs, high image quality, lower radiation dose and automated reading (CAD) eliminates inter-observer variation. dCXR can be used as a low cost and rapid triage test to select individuals for further sputum examination and it allows for high throughput of large groups of people. dCXR has a high negative predictive value for pulmonary TB , is rapid (1 minute) and costs less than 25% of one Xpert® test, depending on settings. 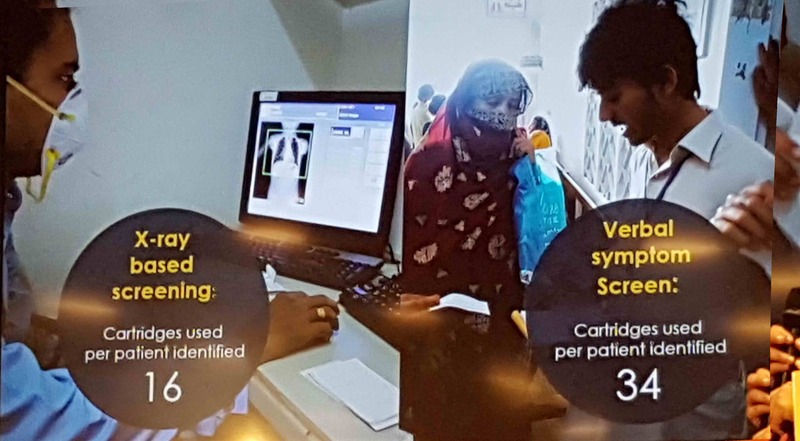 Digital X-ray will give patients access to fast, accurate and convenient TB screening, which can contribute to reducing their travel cost, waiting time and speeding up access to diagnosis and treatment. Intensified TB case finding using digital radiology will support the combat against TB in people living with HIV who often present with smear negative sputum. New technology X-ray allows for low dose exposure for patients, making it an appropriate tool for screening of key populations. In combination with molecular tests, the time to diagnose active TB can be shortened from often 10-20 days to several hours. Digital radiology can also be used to spot pre-clinical TB and can support the health system in general, through diagnostic imaging of also other body parts. Digital X-rays are instantly available on the diagnostic monitor with constant high quality. Software tools to zoom in or to add contrast to the digital image enhance ease and accuracy of TB screening. Issues of poor readability and deterioration or loss of films are eliminated. Films and developer are no longer needed, storage of images is done electronically and superior readability allow for a very low cost per image. Cost savings relative to analog systems using films in high throughput settings can exceed € 50.000 per year per system. Even at a low throughput of 30 images per day, digital images are more economic. Digital radiology systems using an integrated Picture Archiving and Communications System (PACS) can efficiently archive and retrieve large numbers of digital X-rays. This eliminates the high archiving cost of analog film based X-ray images. Using the universal Digital Imaging and Communications in Medicine (DICOM) format, the PACS attaches patient information to the right X-ray , eliminating the risk of “storing a film in the wrong envelope” and, enhancing patient safety. Digital X-ray is clean technology as chemical waste from film developing, that can cause serious environmental damage, is completely eliminated. 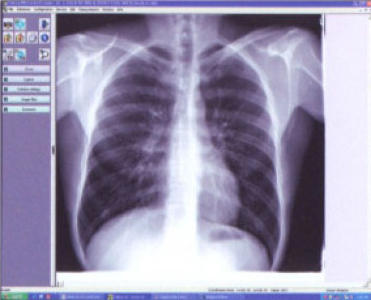 If the X-ray image cannot be interpreted locally because the specific skills are not available or the image is particularly difficult to interpret, it can be sent over the internet or even over a low bandwidth (mobile phone) connection to a centre where expert reading can be done. The diagnosis can be sent back immediately and continues to be attached to the right digital Chest X-ray. CAD allows for the automated recognition and quantification of abnormalities consistent with TB in a digital Chest X-rays (please see CAD description). Depending on the budget NTPs can select an abnormality threshold for Xpert® eligibility which allows for opting for higher sensitivity at reduced specificity (lower CAD score threshold) and vice versa (higher CAD score threshold). Zambart in Zambia put this threshold at > 60% CAD abnormality score resulting in a high predictive value (23%) for a positive Xpert® MTB/RIF test . At recent UNION World Conferences the high sensitivity of Chest X-ray was illustrated by findings in the TB prevalence surveys in Namibia, Viet Nam, Ethiopia, Kenya, Malawi, Rwanda, Ghana and Cambodia. IRD presented at the 2018 UNION in The Hague the Zero TB initiative (cost) effectiveness using digital radiology as a rapid triage before Xpert®, compared to screening on symptoms only (please see below). The fact that screening on symptoms suggestive of TB only can result in missing more than 50% of TB cases, now makes Chest X-ray a mandatory part of any TB prevalence survey. In the next table three X-ray technologies – analog (film based), Computed Radiology (CR) and Direct Digital Radiology (DR) - are compared on key aspects. Digital Radiology technology fit for low and medium resource areas is to be designed as a: “single phase (220V), solar powered system and easy to use in the field; a system that allows to make, store, and diagnose CXRs from anywhere and can cope with high ambient temperatures and humidity"
Latest technology can ensure low dose for the patient and instant high quality images for the medical doctor or radiologist. A DR system includes a workstation for diagnosis and an archive server. Integration with archive and viewing software makes the system suitable for fast and efficient medical use. Image reading can be done immediately on the diagnostic monitor, or at any location in the world by sending a compressed image to a centre with qualified staff to read radiographs. A daily throughput of more than 300 images can be achieved per system. Maintainability in the field is generally high if the X-ray unit comprises components that can be swapped easily. In addition components have to be engineered for shock resistance and the system is to be supported by rubber shock absorbers. Remote system testing using internet and built in test equipment can indicate any component to be replaced or serviced. First installations in-country are recommended to be done by factory trained engineers. The imaging process: Software when designed with the input of users and radiology specialists warrants an intuitive user interface. Most user interfaces are Windows™ based and appear similar to well-known applications. Making an image: First, patient demographic information is entered by the keyboard, scanner or DICOM Modality Worklist. Second, the image is taken. The Automatic Exposure Control will give high quality Chest X-rays with the lowest possible dose for the client. Diagnosing everywhere: Immediately after the image appears on the screen it can be relayed to any central database anywhere in the world and is typically available just three seconds after the exposure has been made. When using the mobile phone GSM network sending a compressed 350KB image to a diagnostic centre will take about 35 seconds provided image compressing and communication software is used. Kranzer, K. et al. The benefits to communities and individuals of screening for active tuberculosis disease: a systematic review [State of the art series. Case finding/screening. Number 2 in the series]. Int J Tuberc Lung Dis. 17.4, 432–446 (2013). Dr Knut Lönnroth WHO - PSI/GT; UNION Liverpool October 2016. Onozaki, I. et al. National tuberculosis prevalence surveys in Asia, 1990–2012: an overview of results and lessons learned. Trop Med Int Health. 20.0, 1128–1145 (2015). UNION 43rd World Conference Assessing two algorithms for TB diagnosis using GeneXpert® MTB/RIF in primary health care settings in Lusaka, Zambia Muyoyeta M, Moyo M, Maduskar P, Kasese N, Milimo D, Spooner R, Kapata N, Hogeweg L, van Ginneken B, Godfrey-Faussett P, Ayles H.